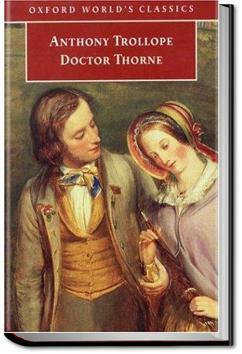 Doctor Thorne is the third of Trollope's Barsetshire novels, and unlike some of the others, has little to do with the politics and personalities of the Church of England, or politics on the national level (though there is lots of politicking in the mythical county of Barsetshire itself). The plot revolves around the illegitimate Mary Thorne, who has been lovingly raised by her uncle, a country doctor, and who, as she comes of age, finds herself wondering whether she is a lady (in the county sense of the term). Frank Gresham, son of the squire of Greshamsbury, is in love with her (much against the wishes of his noble de Courcy relatives at the Castle), but she dismisses his affection at first as mere puppy love, thereby setting the scene for a series of entanglements, social, romantic, and of course, financial and propertied (never far from the action in Trollope's works). Their resolution, of course, makes up the meat of the novel. One critic has remarked that in Doctor Thorne Trollope succeeds in one of the most difficult tasks an author of fiction can face: how to make genuinely good people genuinely interesting, so that they engage not only the sympathies but also the interest of readers. . . ., but speaking, nevertheless, as though to himself. "It is a matter of no moment," said his aunt, almost angrily. "When the subject itself is of such vital importance, objections of no real weight should not be brought into view. If you wish to hold up your head in the country; if you wish to represent your county in Parliament, as has been done by your father, your grandfather, and your great-grandfathers; if you wish to keep a house over your head, and to leave Greshamsbury to your son after you, you must marry money. What does it signify whether Miss Dunstable be twenty-eight or thirty? She has got money; and if you marry her, you may then consider that your position in life is made." I have never read anything by Anthony Trollope until now. Of course, I've heard of him alongside names such as Charles Dickens and an earlier generation edified by Jane Austen and the Bronte sisters. Doctor Thorne is the third novel in Anthony Trollope’s series known as the Chronicles of Barsetshire; set in Greshamsbury, a rural town many miles away from the cathedral city the was the setting for the first two novels. I think I read this out of order but it doesn't even matter because either way, the story was fabulous!